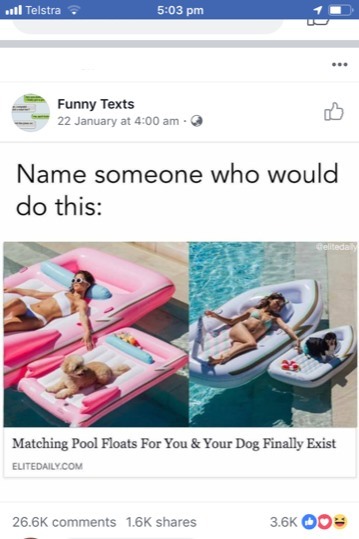 One of the team in the office tagged another on this post below featuring dog floats. I’m not sure if it is, but that could be very smart marketing. Promote your product in a meme and have others identify and connect with your target audience to get the product in front of them. It’s possible the meme maker can then create ads targeting all of the people interacting with the meme – and boom! they’re in front of their perfect target market – and all of the hard work has been done by others.